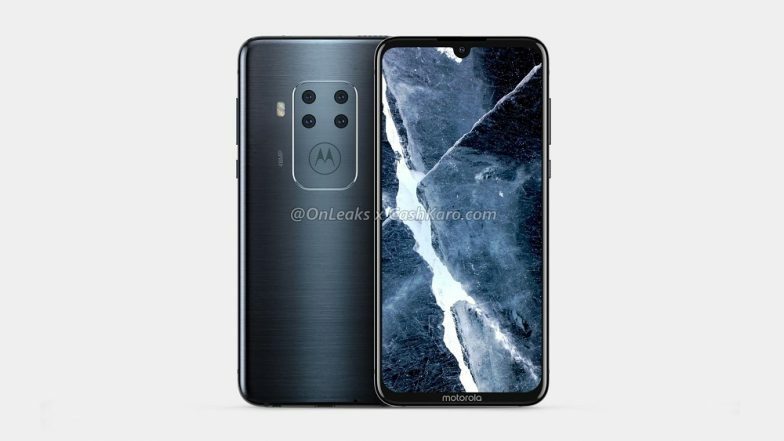 Motorola, the Lenovo-owned company is reportedly working on a new smartphone which has been leaked online revealing some exciting details about the mysterious handset. The leaked image reveals that the phone will be packed with four cameras at the rear. Courtesy of Cashkaro, the new render images reveal the upcoming mysterious phone from various different angles. The report also underlined that the phone will get a 6.2-inch screen, waterdrop notch and in-display fingerprint sensor. Moto G7, Motorola One Smartphones Officially Launched in India at Rs 16,999 & Rs 13,999. Going by the render images, the smartphone will sport four rear camera with a little camera hump. From the renders, we can also spot company’s logo beneath the camera setup. However, the LED flashlight is adjacent to the module. Featuring a metallic finish at the back, the phone also gets an earpiece above the selfie camera. The power buttons and volume rockers are positioned on the right side of the device. At the top, the phone gets a speaker grille which looks pretty odd out there along with SIM tray and microphone. At the bottom, the phone will get a 3.5 headphone jack and USB Type C port for charging and data transfer. WhatsApp, Facebook & Instagram Will Not Work on These Phones From April 30; Is Your Smartphone On The List? As a reminder, the phone maker recently introduced Moto G7 and Motorola One device in the Indian market. As Motorola One is priced at Rs 13,999, the Moto G7 device costs Rs 16,999. The latter come with a 6.24-inch FHD+ Max Vision display with resolution of 1080 x 2270 pixels and 19:9 aspect ratio. The display of the phone is also protected by Corning Gorilla Glass 3. On the other hand, the Motorola One Power device sports a 5.9-inch panel with aspect ratio of 18.5:9 and resolution of 1520 x 720 pixels.